Von ormy—The San Antonio River Authority (SARA) has purchased the infamous Pucek Catfish Farm and has plans to convert it to a public park with Medina River access. The park entryway is on old Pearsall Road and the property lies 1/2 in Von ormy and 1/2 in San Antonio. SARA planners held a public hearing at Southwest High School to receive input in November and have plans to open the park as early as the fall of 2014. Newly elected SARA District 1 Board Member Jerry G. Gonzales was present and expressed his support to build a park in Von ormy. SARA is considering a wide range of park improvement, including sports fields, river access points, fishing piers, trails and ATV usage. The "Catfish Farm" is a Von Ormy icon made famous by Ron Pucek who opened his Living Waters Artesian Springs catfish farm in Von Ormy in March of 1991. Because the "right of capture" prevailed, he was free to take as much water from the Edward's Aquifer as he could put to a beneficial use. The right of capture is the legal principle that the water under a person's land belongs to that person and they are free to capture and use as much as they want. Many eyebrows were raised when news reports indicated he had drilled the world's largest water well and was using about 45 million gallons per day - enough water to support 250,000 people, about one-fourth of San Antonio's population at the time. Even more startling was the realization that if Pucek's use was legal, it meant that San Antonio had no firm supply of water at all. Because the Edwards Aquifer flowpaths are generally from southwest to northeast, Pucek's well was just upstream of all of San Antonio's pumping centers. The incident served as a psychological turning point in the way the region thought about and managed water. There is tremendous artesian pressure at this location. When this well came in, it blew out rocks the size of basketballs 20 feet into the air. The well was massive, 30" in diameter, and capable of producing 40 thousand gallons per minute. Water came out of the ground at 89 degrees, and by the time it flowed through a canal and into the raceways, it was the optimum temperature for raising fish - about 86 degrees. Since the volume of water passing through the raceways was so huge, there was little concern for disease among the fish and the quality of water discharged to the Medina River was very high. However, because small amounts of fish pee and other impurities were present, the water was classified as an untreated waste and was not considered potable. Not that it really was potable to begin with - the site is close to the fresh/saline water interface of the Edwards and in addition to having an elevated temperature, the water had a distinct sulfurous odor, which is very common of Edwards wells in this area. It probably would not have been considered suitable for distribution to humans. 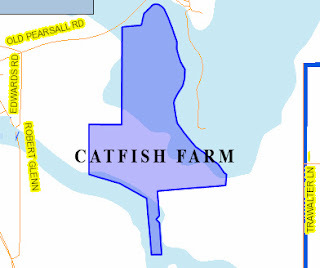 The catfish farm was in full-swing operation for only one season in 1991 before it was forced to shut down because of the fish pee. It wasn't the huge volume of water that was the problem - it was that Pucek lacked a permit under the Clean Water Act to discharge water into the Medina River. In February of 1996, the farm reopened using only 2% of the previous flow to grow a small crop of catfish and some ornamental Japanese koi. A holding pond was built, and the idea was that all the water used would be retained on the property. Mr. Pucek did not need a discharge permit if the water did not leave his land. However, the Edwards Underground Water District asserted the design of his holding pond was faulty and that water was still being discharged to the Medina River illegally. Facing tremendous legal costs, Mr. Pucek agreed to truck his fish elsewhere and once again shut down the farm. The San Antonio ExpressNews once summed up Von ormy's culture with the phrase "it's a hotbed of revolution." Ron Pucek fits this mold well and his catfish project fundamentally and dramatically changed water law, aqua business and natural resource management. Pucek and his backers spent over $1 million to drill the world's largest water well and build raceways, and they produced a healthy food crop that could have been worth up to $25 million per year. Many argued, however, that no one should be able to use that much water. On the other hand, the law was on Pucek's side. And his use of the water was almost completely non-consumptive. All the water he used was available for nonpotable re-use by others, and to many it seemed his use of water to grow a food crop seemed much less "wasteful" than using it to keep lawns green in the summertime. In the eyes of San Antonio water officials, Pucek was a heinous waster of a precious resource. In the eyes of many farmers, he was not much different from them and was being singled out for criticism. The whole situation led to the legislature's establishment of the Edward's Aquifer Authority (EAA) that replaced the century old law of the "rule of capture" and established new limitations and restrictions on aquifer usaga. When the new EAA rules were applied, Pucek claimed a maximum historical use of 46,483 acre-feet in his EAA permit application. In 2000 the EAA proposed a permit for 17,724 acre-feet. On December 5, 2000, the San Antonio Water System board of trustees agreed to buy Pucek’s catfish farm and most of his water rights for $9 million. The sale included 10,000 acre-feet of pumping rights for the city of San Antonio, Pucek’s 85 acre farm, the right to lease Pucek’s all or part of his remaining 7,724 acre-feet for $25 an acre-foot for five years, and the right to match after that any offer Pucek might receive to buy or lease the rights. The sale brought an end to almost a decade of contentious squabbles and closed out the possibility of future litigation. SAWS board chairman Juan Patlan said “Pucek and his financial partners were very smart, very shrewd. They were watching what was going on, and they gambled that eventually they were going to have the right to a lot of water, and they were right.” Overall, SAWS has paid Pucek more than $30 million for water sales, leases, land, and equipment. In October 2006, SAWS modified the artesian well to convert it into a monitoring well for a saline water line study. As mentioned above, the well was very close to the interface between fresh and saline water. The well was rather large for serving the purpose of a monitoring well, so in 2007 SAWS drilled a separate monitoring well on the property and in 2009 it plugged the famous irrigation well. In June of 2010, SAWS declared the property to be surplus to its system and in March of 2011, Bexar county agreed to purchase the property from SAWS for a flood control project to alleviate flooding in the City of Von Ormy. That deal fell through, but in August of 2013 the SAWS Board of Trustees approved a sale of the 85-acre property to the San Antonio River Authority for $315,000.